Oily skin is a major concern for people of all skin types and ages around the world. When it comes to finding new treatments for oily skin and improve skin quality, the dermo-cosmetic industry focuses on controlling sebaceous glands, as they are in charge of sebum production. To study the response of sebaceous glands to new cosmetic ingredients, adapted models are required to conduct efficient analysis. Syntivia’s cosmetic scientists provide a new approach. Syntivia’s hi-tech laboratory uses the skin explant model HairSkin® (Genoskin), obtained from plastic surgery, which is kept in a state of survival for 7 days to allow ex vivo studies of sebaceous glands. Thanks to these skin explants, the sebaceous glands can be observed both in 2D-sections and using 3D microscopy. This approach allows visualizing both sebocyte differentiation through immunostaining and lipidic production with a specific staining method. 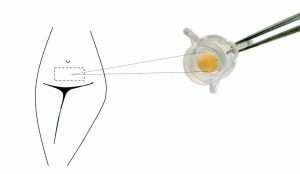 The Syntivia team also quantifies the volume of sebaceous glands. These analysis techniques are a promising new strategy to test active cosmetic ingredients and visualize their effects on appendages involved in sebum production. 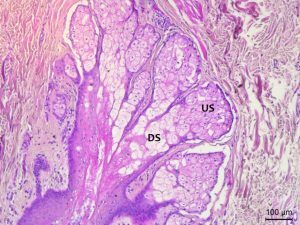 Cross section of sebaceous gland after histological coloration. US : Undifferentiated Sebocytes, DS : Differentiated Sebocytes. Immunochemistry labelling of sebaceous glands in skin explant to detect proteins implicated in sebaceous gland maturation: Marker associated with lipid production (A, B) Marker of undifferentiated sebocytes labelling (C, D). Nuclei are labelled with DAPI in blue. The red labelling associated with lipid production is linked to differentiated sebocytes. 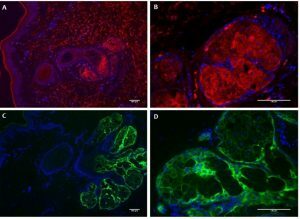 Intense labeling in sebaceous gland lobules is observed. A gradient is visible as central cells are more intense than at the periphery, which highlights the sebocyte differentiation gradient in the glands. Peripheral cell layers show green labelling where sebocytes are undifferentiated and do not produce lipids yet. The sebaceous glands are analyzed directly inside the skin explants, which are made transparent using our transparization technique. The volume of each gland can be quantified in the whole skin explant to compare sebaceous gland volume in samples treated with different compounds. 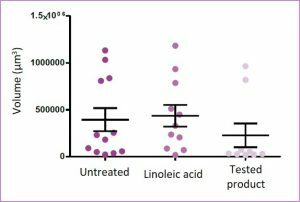 The average of the volume values obtained reveals a visible trend: the sebaceous glands are slightly larger after treatment with linoleic acid while they atrophy with the test product. The Syntivia team is still completing these studies with more details, but don’t hesitate to contact us for more information on these new evaluation techniques.